»Mysore To Horsley Hills – A Silky Drive Amidst The Hills! One of the popular getaways, Horsley Hills is the best tourist place in Andhra Pradesh. The hill is surrounded with dense forests. The beauty is enhanced with numerous herbal trees all around. With so much fresh air, a traveller is left with bliss and tranquillity. The forests here are adorned with trees like gulmohar, allamanda, reetha, amla, beedi leaves, blue gum, eucalyptus and sandalwood. The drive to Horsley Hills is heavenly. With trees and vegetation all around, one can indulge in the beauty that the hills are bestowed with. The climate is pleasant all through the year. Named after the then collector, WD Horsley, the scenic destination stands tall at the height of 1,265 metres above sea level. Adventure junkies must give zorbing a try as it is one of the few destinations in India where the activity is held. Rappelling and trekking are other options. One can also spot bears, wild dogs, sambhars and panthers seeking shelter amidst the forests. The accessibility to Horsley Hills is quite good from Bengaluru and Tirupati. Thus, it's a perfect weekend getaway for nature lovers. November to March is the best time to visit this enchanting and charming destination. The temperature ranges between 10 degree Celsius to 22 degree Celsius. Monsoons are also bright and light here as the town experiences moderate rainfall between June to September. Summers are comparatively hot and are normally avoided by tourists. Route 1 can be covered in 6 hours and 30 minutes. Route 2 takes approximately 7 hours. Thus, route 1, being the fastest route, is preferable. Start early from Mysore. Have a scrumptious traditional breakfast at Vinayaka Mylari. About 98 km from Mysore, you will come to the city of silk cocoons - Ramanagara. A trekker is sure to find solace in this small and quaint city. If you are falling short on time, Ramadevara Betta hill is a superb trekking option for half a day. You can also adopt to trek and camp on six other hills here if time is not a constraint. Witness some extinct birds and have a gala time at Ramadevarabetta Vulture Sanctuary. This beautiful town is well known for sericulture. The silk produced in this region is a primary raw material for world-renowned Mysore sarees. Asia's largest silk market is right here! Arkeshwara Temple, Malleshwara Temple, Banni Mahakali Temple and Chamundeshwari Temple are some spiritual abodes where you can attain peace. Just an hour's drive from Bengaluru, at a distance of about 92 km from Ramanagara lies the historic city of Devanahalli. It is the birthplace of Tipu Sultan. Devanahalli houses the magnificent fort that the ruling dynasties held in the 15th century. The temple of Venugopala Swamy is the most ancient and visited amongst all other temples within the fort. The temple walls are adorned with scenic versions of Ramayana. Visit Tipu Sultan's memorial as well as his private park where he used to relax. After a 51 km drive, you will arrive in the city of tomatoes and silk - Chintamani. This quiet and religiously driven village is named after the Maratha Chieftain Chintamani Rao. Kailasagiri and Ambaji Durga cave temple should be on your list while you cross Chintamani. 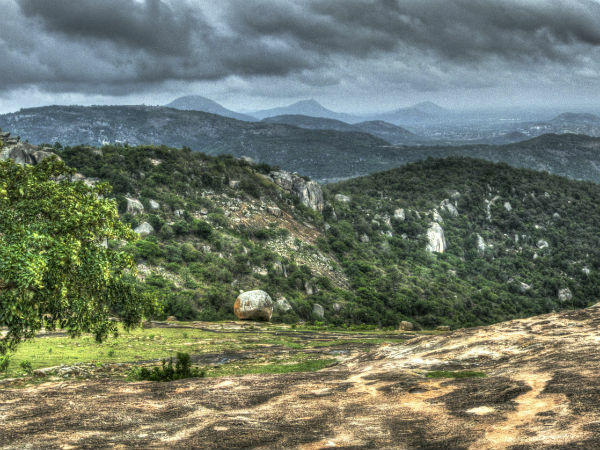 Drive for 75 km further to arrive in another gorgeous state of Andhra Pradesh and at your destination - Horsley Hills! By Rail: Madanapalle railway station is the nearest railway station. Horsley Hills is about 26 km from here. The train connectivity to Madanapalle is decent from cities like New Delhi, Bengaluru, Mysore, Lucknow, Chennai, Patna, Kanyakumari and Gaya. By Bus: Horsley Hills is well connected with other parts of the state by Andhra Pradesh State Road Transport Corporation (APSRTC). Although the travel might be inexpensive, it is not recommended if you are loaded with luggage. Direct buses frequently run between Madanapalle and Horsley Hills. By Air: Kempegowda International Airport, stationed in Bengaluru, is the nearest airport to Horsley Hills. The distance between the two is about 144 km. Encircled with eucalyptus trees, Lake Gangotri is serene in its own ways. It is quite peaceful to just spend some quality time with your loved ones. Nature admirers should not miss visiting this beauty of nature. The lake dries up in summers and attracts numerous tourists as monsoon approaches. Feel the wind on your skin, once you land in this mind-blowing location. Nicknamed as Windy Rock, it's an enchanting feeling to walk the entire hill with the valley views gracing it. Gali Bandalu is surrounded by natural lakes and parks. Heavy winds keep attracting the peace lovers every now and then. One of the most ancient temples in Horsley Hills, Mallamma Temple is dedicated to Goddess Mallamma. It is one of the most visited and important tourist spots located at the hilltop. There was a small girl named Mallamma who used to heal the tribal people. The elephants took care of her. After she disappeared suddenly, the natives and her devotees started believing that she was a goddess and built a temple in her memory. You can't miss visiting this zoo once you end up at Horsley Hills. With thick vegetation all over and few animals here and there, the zoo is a perfect option for a day out with family. There is also nature and wildlife to look for at the zoo.